Ballerina (titled Leap! in the United States) is a 2016 3D computer-animated musical adventure comedy film co-directed by Éric Summer and Éric Warin and written by Summer, Carol Noble and Laurent Zeitoun. A co-production between Canadian and French companies, the film follows a poor orphan girl who dreams of becoming a ballerina and gets a chance to audition for the celebrated school of the Paris Opera Ballet. Ballerina stars the voices of Elle Fanning, Dane DeHaan, Maddie Ziegler and Carly Rae Jepsen. The film was released in cinemas in France and the United Kingdom on 12 December 2016, followed by releases in various countries over the following several months, including Canada on 24 February 2017. The film was released in the United States on 25 August 2017, with the voices of Nat Wolff (who replaced DeHaan), Kate McKinnon and Mel Brooks added. In the 1880s, Félicie (Elle Fanning), a poor orphan girl who dreams of becoming a ballerina, but lacks formal training, runs away from her orphanage in rural Brittany with her best friend, Victor (Dane DeHaan), a young inventor. Together they go to beautiful Paris, but they soon become separated, and Victor becomes an office boy in Gustave Eiffel's workshop. Félicie finds her way to the Paris Opera, where the guard catches her trespassing. She is rescued by a mysterious cleaner with a limp, Odette (Carly Rae Jepsen), who agrees to let Félicie stay with her until she gets on her feet. Odette works for both the Opera and for the cruel and imperious Régine Le Haut (Julie Khaner), a wealthy restaurant owner. While helping Odette clean, Félicie spies Regine's daughter, Camille (Maddie Ziegler), practicing ballet. Camille sees Félicie, insults her, and throws Félicie's treasured music box out of the window, breaking it. As Félicie takes it to Victor for repair, she intercepts the postman who brings a letter from the Opera admitting Camille to the celebrated school of the Paris Opera Ballet; in her anger, she hides the letter and decides to assume Camille's identity to get into the school and pursue her dream, while also getting back at Camille. Odette agrees to mentor Félicie, who later learns that Odette was a former prima ballerina. Félicie finds her training very difficult, but with Camille's letter of acceptance, she manages to take her place at the ballet school. Mérante (Terrence Scammell), the school's exacting choreographer, announces that one of the girls from the class will be chosen to dance the role of Clara in The Nutcracker. He dismisses the worst dancer in class each day. Félicie improves each day and narrowly avoids elimination, but a couple of days before the final elimination, her lie is discovered. Mérante decides to admit Camille into the class, while also letting Félicie stay; although Félicie's infraction was serious, Mérante knows that she is Odette's protege, and he has a soft spot for Odette. The night before the final elimination, Félicie neglects training to go out on a date with Rudi, a handsome boy from the school, which disappoints Odette. Victor, who has a crush on Félicie, sees Félicie with Rudi. Victor is jealous, and he and Félicie argue. The next day, Félicie is late to the audition and unable to perform well, and so the part of Clara goes to Camille. Félicie returns to her orphanage, having lost her spirit. She has a dream about being an infant in the arms of her late mother, a ballerina, who gave her the music box. She decides to return to Paris to help Odette and apologize to Victor. While cleaning the stage, Félicie encounters Camille, and they engage in a dance battle that is witnessed by all the students, Odette and Mérante. Félicie does a grand jeté over a flight of stairs, while Camille cannot. Mérante approaches the two girls and asks them why they dance, to which Camille admits that she dances only because her mother tells her to, while Félicie speaks stirringly of dance as her inheritance and passion. Camille admits that Félicie should dance Clara. Near Eiffel's workshop, where the Statue of Liberty is being constructed, Félicie invites Victor to the performance. A furiously deranged Régine arrives, chases Félicie up to the crown of the statue and forces her off, but Victor saves her with aid from Camille. They arrive at the Opera just in time for Félicie to don Odette's special pointe shoes; Félicie kisses Victor on the cheek, and she performs in The Nutcracker. There is also a French language version of the film, with the voices of Camille Cottin as Félicie and Malik Bentalha as Victor, that premiered in France on December 14, 2016. The film was produced at L'Atelier Animation in Montreal, Quebec, Canada. The filmmakers used key frame animation of Aurélie Dupont and Jérémie Bélingard, two star dancers of the Paris Opera Ballet, to translate realistic dance choreography to the animated film. Dupont became the de facto choreographer of the film's dance sequences. The soundtrack album was released internationally by Gaumont on December 12, 2016. The album features both the film's original score composed by Klaus Badelt, and songs from other artists that are used in the film. The film also features songs that are not included in the album, such as "Cut to the Feeling" and "Runaways" by Jepsen and "Suitcase" by Sia. The film premiered at the Mon premier Festival on October 19, 2016, and it was released in France and the UK in December 2016. Numerous releases followed around the world. Entertainment One distributed the film in Canada, with the theatrical release beginning on February 24, 2017 in Quebec and March 3, 2017 elsewhere in Canada. In May 2016, The Weinstein Company acquired distribution rights to the film in the United States. A US release was first scheduled for March 3, 2017, under the title Leap! The release was subsequently pushed back to April 21, 2017, followed by additional casting announcements of Wolff, Brooks, and McKinnon. It was then pushed back to August 30 and later moved up to August 25, 2017. As of 7 December 2017[update], Ballerina had grossed approximately US$106 million worldwide. It opened in France on 14 December 2016 with over half a million admissions, earning €2.2 million (~US$2.4 million) over the course of the weekend. Its French gross eventually reached $14.5 million. In Canada, it earned more than C$1.5 million during the first 13 days of its theatrical run, $1.1 million of which was made in Quebec. It ultimately grossed a total of $3.6 million (~US$2.8 million) in Canada. It was released on 25 August 2017 in the United States, earning $4.7 million over its opening weekend. As of 7 December 2017[update] it had grossed $21.9 million in the US, the film's highest-grossing territory. On review aggregator website Rotten Tomatoes, the original version of the film holds an approval rating of 75% based on 32 reviews, with an average rating of 5.74/10. On French entertainment information website AlloCiné, the film has an average grade of 3.5/5, based on 17 critics. On Rotten Tomatoes, the US version of the film, entitled Leap!, has an approval rating of 39% based on 59 reviews, with an average rating of 4.78/10. The site's critical consensus reads, "From its bland story to its unremarkable animation, Leap! does little to distinguish itself from a long list of like-minded – and superior – family-friendly alternatives." On Metacritic, which assigns a normalized rating to reviews, the film has a weighted average score 48 out of 100, based on 18 critics, indicating "mixed or average reviews". Audiences polled by CinemaScore gave the film an average grade of "A" on an A+ to F scale. Melissa Stewart of Insights magazine of Australia called the film "a heart-warming adventure. ... With the animation capturing the elegance of ballet, it is hard not to be mesmerised by the pirouettes and grand jetés. ... [Félicie's] journey will resonate with for anyone who has experienced the sting of failure and trying to figure out how to bounce back. All of this occurs while humour is trickled throughout the movie making it enjoyable for kids and parents alike. ... [T]he themes of fighting for your passion and dreams is timeless." Mike McCahill of The Guardian wrote: "It's attentively, attractively designed – with a real eye for the light hitting the buildings of a city under construction – but a shade more Black Swan in its DNA might have made the happy ending less inevitable and its pep less repetitive." ^ "Ballerina". British Board of Film Classification. Retrieved 1 February 2017. ^ Keslassy, Elsa (14 May 2013). "'Ballerina': Quad, Gaumont Dance Pas de Deux". Variety. Retrieved 14 May 2013. ^ a b "Leap! (2017)". Box Office Mojo. Retrieved 7 December 2017. ^ Moniuszko, Sara M. (August 24, 2017). "'Leap!' is a major jump for Maddie Ziegler's budding acting career". USA Today. Retrieved January 15, 2018. ^ a b c Fleming Jr, Mike (17 March 2017). "Kate McKinnon Leaps Into Animated Pic With Trio of Voices". Deadline Hollywood. Retrieved 17 March 2017. ^ a b Seetoodeh, Ramin; Keslassy, Elsa (11 May 2016). "Cannes: Weinstein Co. Acquires U.S. Rights to Gaumont's Animated Film Ballerina (EXCLUSIVE)". Variety. Retrieved 23 December 2016. ^ "'Ballerina' Soundtrack Details". Film Music Reporter. 10 December 2016. Retrieved 23 December 2016. ^ Tom, Lauren (26 May 2017). "Carly Rae Jepsen Releases 'Leap' Track 'Cut to the Feeling': Listen". Billboard. ^ "Mon premier Festival programme". Mon premier Festival. Archived from the original on 12 October 2016. Retrieved 5 October 2016. ^ West, Brianna (6 October 2016). "Maddie Ziegler and Elle Fanning's New Ballerina Movie Trailer Is Here". Teen Vogue. Retrieved 23 December 2016. ^ Hontebeyrie, Isabelle (February 18, 2017). "Ballerina: le Québec entre dans l'animation". Canoe.ca. Postmedia Network. Retrieved March 7, 2017. ^ "Ballerina-Showtimes & Trailer-Landmark Cinemas". Landmark Cinemas. Retrieved March 7, 2017. ^ "eOne Films Canada - Film Listings". Entertainment One Films Canada. Entertainment One. Retrieved March 7, 2017. ^ D'Alessandro, Anthony. "Weinstein Co.’s Ballerina Animated Pic ‘Leap!’ Jumps To April", Deadline Hollywood, February 7, 2017, accessed February 9, 2017. ^ D'Alessandro, Anthony; Busch, Anita (July 21, 2017). "Weinstein Co.'s Ballerina Toon Leap! Jumps Up From Labor Day – Update". Deadline Hollywood. 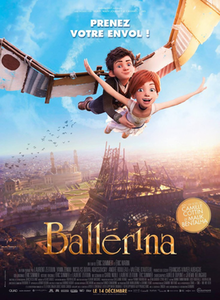 ^ "Box Office du film Ballerina". AlloCiné. Retrieved 25 August 2017. ^ "France Box Office – December 14–18, 2016". Box Office Mojo. Retrieved 28 August 2017. ^ "France Box Office – December 14–18, 2016 (US dollars)". Box Office Mojo. Retrieved 28 August 2017. ^ a b "Leap! (2017) – International Box Office Results". Box Office Mojo. Retrieved 7 December 2017. ^ Pinto, Jordan (10 March 2017). "Ballerina breaks $1.5 million at domestic box office". Playback. Retrieved 25 August 2017. ^ "Hot Sheet: Top 5 Canadian films May 5 to 11, 2017". Playback. Brunico Communications. 16 May 2017. Retrieved 26 August 2017. ^ "Ballerina (2017) [Canada Only]". Box Office Mojo. Retrieved 28 August 2017. ^ "Leap! (2017) – Weekend". Box Office Mojo. Retrieved 28 August 2017. ^ "Leap! (2017) – Releases". Box Office Mojo. Retrieved 7 December 2017. ^ "Ballerina (2016)". Rotten Tomatoes. Retrieved 21 August 2017. ^ "Critiques Presse pour le film Ballerina". AlloCiné (in French). Retrieved 25 August 2017. ^ "Leap! (2017)". Rotten Tomatoes. Retrieved 6 October 2017. ^ "Leap! reviews". Metacritic. Retrieved 2 September 2017. ^ D'Alessandro, Anthony (August 25, 2017). "The Hitman's Bodyguard' Tries To Deflect Hurricane Harvey & Mayweather-McGregor". Deadline Hollywood.